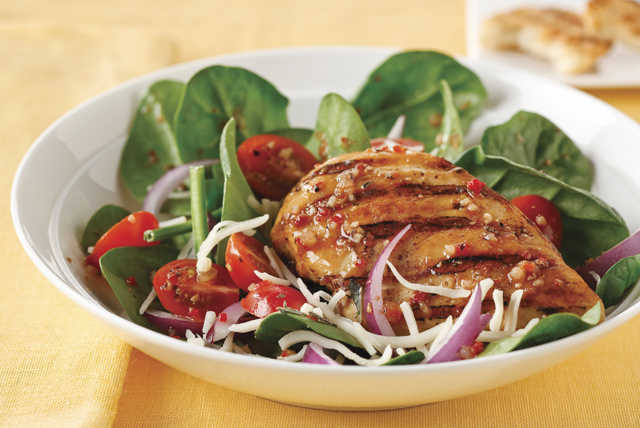 Brush chicken breasts with roasted red pepper dressing prior to grilling in this Mediterranean-inspired salad. Serve with Italian bread and enjoy! Brush bread slices with 1 Tbsp. dressing. Brush chicken with 1 Tbsp. of the remaining dressing. Grill chicken 6 to 8 min. on each side or until done (165°F). Meanwhile, grill bread slices 1 min. or until lightly toasted on both sides, turning over after 30 sec. Combine tomatoes, cheese and basil. Toss spinach with onions and remaining dressing; spoon onto serving plate. Top with chicken and tomato mixture. Serve with bread. Chop fresh basil just before using to keep the leaves from turning black. This will occur if the basil is prepared too far in advance.